The coastline of Cornwall is without a doubt one of Britain's best natural features. The seemingly endless coastline features everything from golden sandy beaches to rugged cliffs that get battered by the never-ending power of the sea. As a landscape photographer, Cornwall has to be one of the top locations in Britain for seascape photography. I'm lucky enough to live near Cornwall, so during the summer months when the days are longer I will often find myself crossing the border from Devon for a spot of photography. One of my favourite locations in Cornwall is Trevose Head. It's a cracking location with rugged cliffs, big crashing waves and a lighthouse. However, further down the coast is Godrevy Point, a very similar bit of coastline that also has a lighthouse. I first discovered Godrevy Point when I was taken there by professional photographer Ross Hoddinott. I was there with my father-in-law to do a feature called "Photo Challenge" for the magazine Digital SLR Photography. Ross had us "competing" against each other in a series of challenges. We visited St Michael's Mount in the morning (somewhere else I must return to), and then later in the day we went to Godrevy point. It was a fantastic day and a lot of fun. If you want to see the article, it was in the December 2014 issue of Digital SLR Photography, so if you have a copy kicking about check it out! I captured some images that even today I'm very happy with (see below). Since that initial visit, Godrevy Point has been on my locations map. However, as it's 2 hours from home, I've always favoured going to Trevose Head which is a little closer. This week I finally decided to return to Godrevy Point. The weather forecast and tides were favourable, and I had enough time to drive there and still have time to take photographs before the sun would set. As it had been nearly fours years since my last visit the first thing I did was have a little walkabout. There are all the cliff top locations to look at, as well as locations down on the beach and the rocky ledges. As I knew the tide was going out, I felt OK about going down onto the ledges. I still had to keep a very close eye on the waves though. It's always best to watch the water for a few minutes before moving onto your next spot as the strength and reach of waves can vary. My first image from my visit, shown below, was taken up on the cliffs along the South West Coast Path. It's a pleasing enough image but it lacks dramatic light. Some light on the island or cliff face to the side would have really lifted the image. Normally I would have also gone for a long exposure here, but I wanted to capture the movement of the waves so went for the shorter exposure time. Godrevy Lighthouse from the South West Coast Path, Cornwall - Nikon D850, Nikkor 16-35 mm f/4 at 25 mm, f/11, 1/10th sec @ ISO 64, Lee Filters Landscape Polariser and 2 stop ND Grad. For my next spot, I decided to leave the South West Coast Path and head down onto the beach and Godrevy Cove. While the lighthouse is a prominent feature of coastline at Godrevy, not all photographs need to include it. The photograph below is actually my favourite of the evening, so it pays to explore an area before digging in your tripod legs. Again for this image, I really wanted to capture the movement of the waves. Using a polariser not only enhanced the colours, and reduced glare, but it also reduced the amount of light entering the camera, allowing me to get a slightly longer exposure without the need for an ND filter. Godrevy Point Waves (Godrevy Cove), Cornwall - Nikon D850, Nikkor 24-70 mm f/2.8 VR at 24 mm, f/13, 1/8th sec @ ISO 64, Lee Filters Landscape Polariser and 2 stop ND Grad. It's important to try new things every now and again, and it's OK to experiment with your photography. While the photograph of the beach stones below might not win any awards, it was still fun to take and provides a welcome break from photographs of waves! Godrevy Point Beach Stones (Godrevy Cove), Cornwall - Nikon D850, Nikkor 24-70 mm f/2.8 VR at 70 mm, f/8, 1/4th sec @ ISO 64, Lee Filters Landscape Polariser. As the sun started to set, I headed down to the rocky ledges to get ready for my final shots of the day. I was hoping for better light, either to illuminate parts of the scene, or for it to go dark and stormy, but I ended up with something in the middle. So while I like the composition of both of the images below, they just lack something to make them special. Maybe I'm just getting fussier with my photogrpahy these days! Dusk at Godrevy Lighthouse, Cornwall - Nikon D850, Nikkor 24-70 mm f/2.8 VR at 27 mm, f/13, 1.3 sec @ ISO 64, Lee Filters Landscape Polariser. Just a little note on the photography below. Unfortunately, both my main tripod and cable release were away for repair making capturing this photograph tricky. I needed to use the self-timer so there wasn't any camera shake from pressing the shutter button. Normally 2 seconds would be enough, but because the tripod wasn't as stable as my normal tripod, it needed to be 5 seconds. This makes timing really difficult as waves aren't as predictable as you might hope! 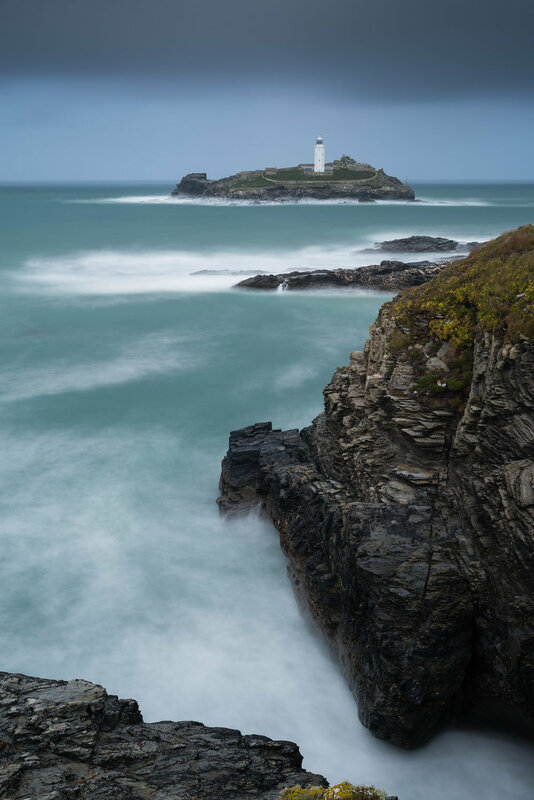 Godrevy Lighthouse from Godrevy Point, Cornwall - Nikon D850, Nikkor 24-70 mm f/2.8 VR at 38 mm, f/13, 0.5 sec @ ISO 400, Lee Filters Landscape Polariser. I really enjoyed my visit to Godrevy. It was great to be back and I really must make the extra effort to return there again. Looking back at my images from 2014 and those I captured this week, I'm not sure that I don't prefer the images from 4 years ago. I think it probably has something to do with the moodier skies of the images back then. Still, I was very happy that I undertook the 4 hour round trip to Godrevy. I also have some exciting news. While I was there, I actually did a little filming for my YouTube channel. I'm producing a video on photographing Cornwall's coastline and Godrevy is one of the featured locations. I'm not sure when the video will be ready, but be sure to head over to my YouTube channel and subscribe. Remember to click on the bell icon as well so you'll receive a notification as soon as I post up a new video. So have you photographed Godrevy Point before? Did you photograph the lighthouse or exclude it? Did you prefer my 2018 or 2014 photographs? Let me know in the comments below.